Black magic prediction through Palmistry, how to predict negative energies impact in life through palm reading, signs showing black magic impacts in life, black magic solutions through astrology and occult science. In this digital era also we can't ignore the existence of black magic or negative energies in life. In my profession i got so many cases daily of black magic and the surprising fact is that the cases comes from the metro cities and from foreign countries too. So this is the reality of life that with positive energies, negative energies also exist and we have to take precaution to protect our self from black magic. Now in this article i am going to tell how we can find a weak hand i.e. how to find weak personalities who easily trapped by negative energies. Now various types of question comes in mind that is it possible to check the negative energies impacts through palm reading?, Do the lines clears that a person is in impacts of negative energies?, Is planetary positions responsible for the black magic impacts or negative energies impacts. Now my answer is 'YES'. It is possible to predict that whether a person is able to get trapped in black magic by studying the palm minutely. 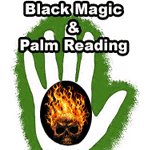 It is possible to find the reasons of black magic through palm reading. If any line from the Rahu area is coming and making any type of net in the moon area with combinations of some particulars line then it is possible that the person will face problem in life because of black magic or negative energies. If the nails are getting dull and rough suddenly then it is confirmed that the person is in impact of any powerful black magic. If the Mounts are depressed and if any black mole is present in the heart line or head line or in moon area then also black magic may easily affect the person. If the hand is full of web, net and skin is dry then also the person may face difficulty because of negative energies. If the rahu plain or ketu plain is affected by any crossed lines then also the person may face black magic problems. Some times the palm become blackish with the impact of negative energies. Sometimes special signs form on the palm which shows the current impacts of black magic or negative energies. Black magic is a very negative impacts of negative energies and it makes our life hell. the whole family gets in problem and diseases arises, conflicts arises, loss in business arises, dullness arises in personality, nightmares starts. So it is very necessary to take proper action to get of from the black magic as soon as possible. Send your details if your family is facing problems due to black magic. Get powerful solutions through astrology and occult sciences to over come from black magic problems now.